This is my lazy enchilada recipe. 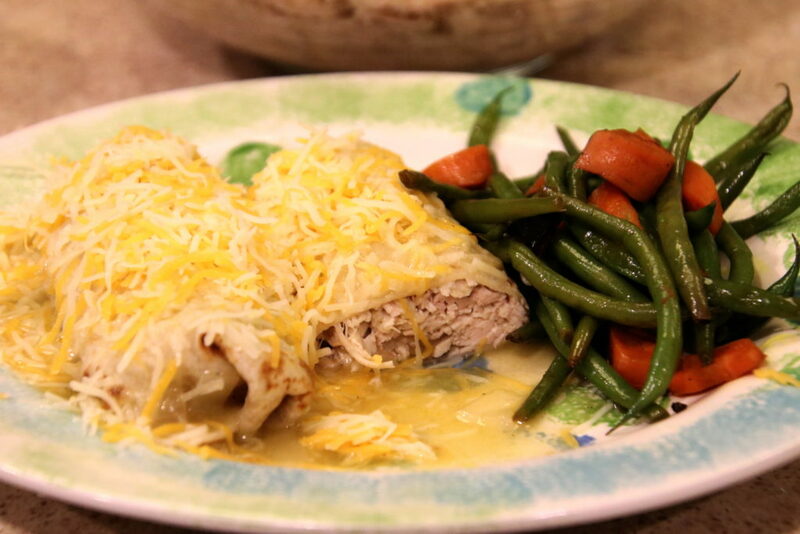 When you want to have enchiladas but don’t want the work, this is a great alternative. 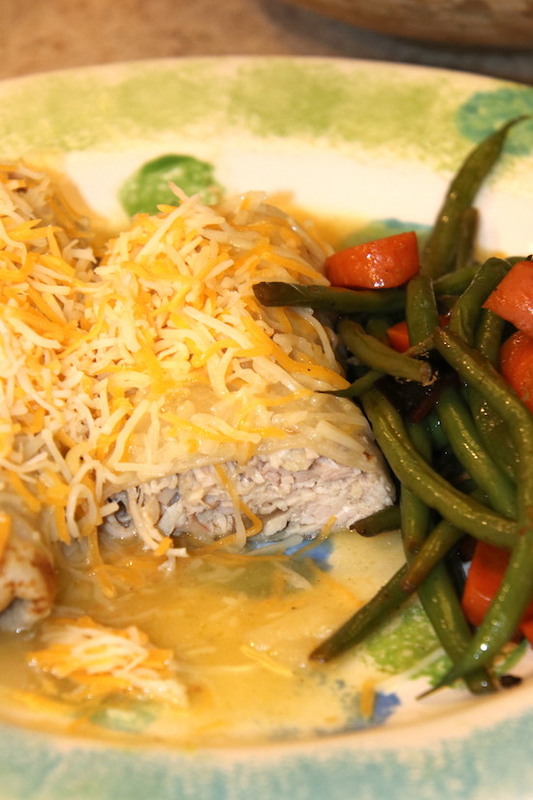 Using the instant pot and just a couple of simple ingredients, a delicious enchilada-like dinner can be on the table in about 30-40 minutes. The base for this recipe is the deliciously simple shredded chicken. 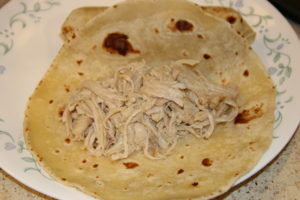 I have another authentic shredded chicken recipe here on Dish Ditty that is more authentic, but it is a little time consuming. Definitely delicious, and if you have a couple hours, it’s worth the work. But, honestly, I’m busy. I don’t have time for a recipe that involved unless it is the weekends. My weeknights are all about getting the food on the table quickly. This recipe fits that bill and is super delicious. The chicken is tender and seasoned. And if you smother it with the sauce and some cheese, it will feel like you are in a Mexican restaurant. So here’s the recipe. I’ve posted some pictures after the recipe to help you roll the burrito if you don’t have experience. Set your instant pot to Saute and add oil and onions. Saute until onions are soft. Add the chicken and sauce. Put on cover and set to high pressure for either 15 minutes if using slow release or 22 minutes if using quick release. Once you have released the lid, turn off the instant pot, remove the chicken and let the chicken cool for about 5 minutes. Shred chicken with two forks. It should shred pretty easily. Add 1/2 to 1 cup of the sauce from the instant pot and mix in. 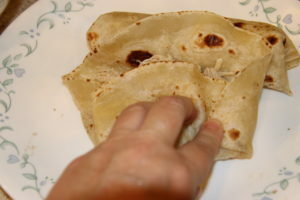 Warm a flour tortilla on the stove in a flat pan. 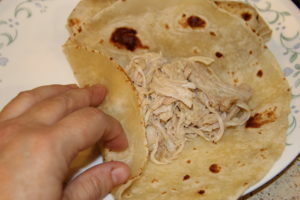 Fill flour tortilla with the chicken filling. 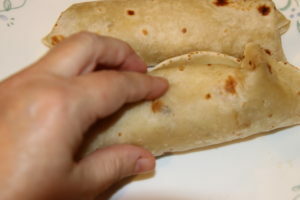 Fold over as a closed burrito with both ends closed (not just one). Cover with sauce and sprinkle on cheese. And that's it! All done! Ready for you to eat. 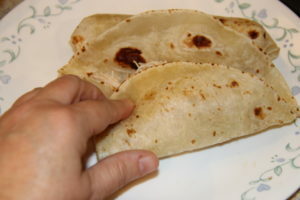 Optionally, you can place under a broiler for 1-2 minutes to melt the cheese, but the cheese will melt as long as the tortilla and sauce is warm. Ok, here’s the instructions for wrapping the burrito. I apologize for the odd angle, but I was wrapping the burrito with one hand and taking the pictures with my other hand. 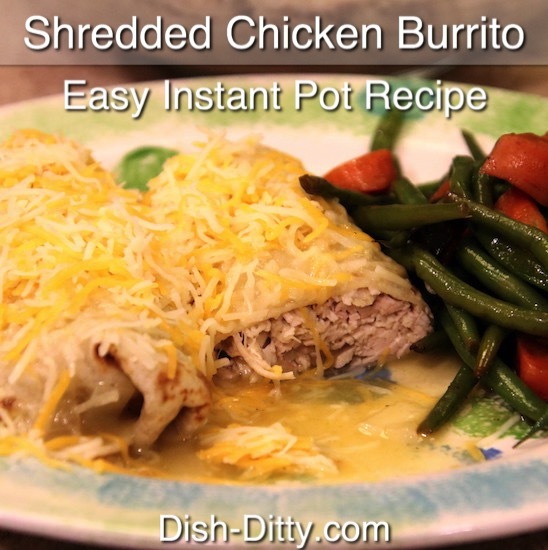 No Replies to "Easy Shredded Chicken Wet Burritos Recipe"